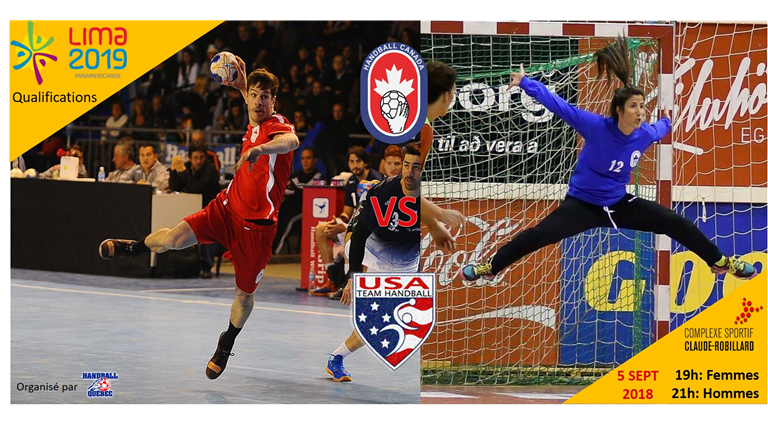 The biggest games of the year for handball start this week as Canada's men's and women's national teams start the Road to Tokyo when they face the United States on September 2nd and 5th with the winner earning a ticket to the 2019 Pan American Games in Peru. That tournament acts as the qualification event for the 2020 Olympic Games in Tokyo. The first leg of the home and away series will take place at Auburn University in Alabama on Sunday September 2nd at 4pm and 6pm. The final matchday will be on Wednesday September 5th at the Claude-Robillard Sports Center in Montreal. The women start the action at 7pm with the men starting at 9pm (all times in EST). The winner will be decided by total aggreggate goals over the two games. The loser wil then advance to a last chance competiton against the teams listed below. Les équipes nationales du Canada, femmes et hommes, affronteront les USA dans deux matchs au mois de septembre. Le match aller se tiendra le 2 septembre à Auburn, Alabama et le match retour le mercredi 5 septembre 2018 au Centre Sportif Claude-Robillard (19:00 l'est USA-CANADA femmes, 21:00 l'est USA-CANADA hommes). Les gagnants se qualifieront directement pour les Jeux Pan Américains de 2019, qui auront lieu à Lima, Pérou. Venez encourager nos athlètes dans leur quête de l'excellence sportive. Le coût du billet est de 15$ et le nombre de places disponibles est limité.